Agensi Kaunseling dan Pengurusan Kredit (AKPK) melantik Azaddin Ngah Tasir sebagai Ketua Pegawai Eksekutifnya yang baharu berkuat kuasa hari ini. Dalam satu kenyataan, AKPK berkata pihaknya yakin Azaddin dapat memacu organisasi itu ke tahap lebih tinggi dalam memberi perkhidmatan pendidikan kewangan, nasihat kredit dan pengurusan hutang kepada pengguna Malaysia. Agensi Kaunseling dan Pengurusan Kredit (AKPK), a wholly owned subsidiary of Bank Negara Malaysia, wishes to announce the appointment of Encik Azaddin Ngah Tasir as its Chief Executive Officer, effective 1 October 2014. Encik Azaddin began his banking career in 1985. He has 27 years of valuable knowledge and experience in the financial industry, in particular, in the area of consumer banking. Prior to his appointment at AKPK, Encik Azaddin was the Senior Vice President / Head Community Business Department of Bank Simpanan Nasional. He was also instrumental in the setting up of the Ejen Bank Berdaftar initiative by Bank Simpanan Nasional which provides basic banking services to the underserved consumers. AKPK is confident that Encik Azaddin will be able to steer the organisation to greater heights in delivering financial education, credit advisory and debt management services to the Malaysian consumers. Agensi Kaunseling dan Pengurusan Kredit (AKPK), a wholly owned subsidiary of Bank Negara Malaysia, has appointed Azaddin Ngah Tasir as its CEO effective Oct 1, 2014. Prior to his appointment at AKPK, Azaddin was the senior VP/head community business department of Bank Simpanan Nasional Bhd (BSN). Azaddin began his banking career in 1985 with over 27 years of knowledge and experience in the financial industry, in the area of consumer banking. He was also instrumental in the setting up of the “Ejen Bank Berdaftar” initiative by BSN which provides basic banking services to the underserved consumers. AKPK is confident Azaddin will be able to steer the organisation in delivering financial education, credit advisory and debt management services to Malaysian consumers. PETALING JAYA: High medical expenses and poor financial planning are the main reasons Malaysians gave for personal debt. This is based on feedback from those seeking assistance from the Credit Counselling and Debt Management Agency (AKPK). AKPK corporate communications head Mohamad Khalil Jamaldin said poor financial planning was cited by 22.8% of applicants while 16.4% incurred high medical expenses. He said 16% cited failure or slow down in business and 10.9% said they lost control of the use of credit cards. “In most cases, the factors contributing to their inability to repay their debts included ignorance and lack of financial discipline to live within their means. “Financial difficulties could also be triggered by a change in circumstances such as health problems, death of a breadwinner, loss of employment and business failure,” he added. He said AKPK’s services were free and the public should not hesitate to seek help at any of its 11 branches and 12 credit counselling offices around the country. Mohamad Khalil said many were reluctant to get help because they were ashamed but he added that their fears were unfounded. He pointed out that as of Aug 31 this year, some 286,368 individuals had attended their counselling services. “Of these, 113,845 customers have applied to enrol in our debt management programme,” he said. Federation of Malaysian Con­sumers Association chief executive officer Datuk Paul Selvaraj said both government policy and personal financial management on the part of the public were needed to tackle the issue of personal debt. Speaking ahead of Budget 2015, Selvaraj said although the country had a fairly good government healthcare system, there was still room to make it more affordable. “Besides encouraging medical insurance, the Government must improve access to medical care for rural communities,” he said. Selvaraj added that it was crucial for the public to become more financially savvy. “It’s inevitable prices will rise due to cuts in subsidies. Consumers need to be smart in order to stretch their ringgit,” he said. Sekitar 99 peratus daripada lebih 347,000 penerima bantuan di bawah skim pembiayaan kredit mikro Amanah Ikhtiar Malaysia (AIM) berjaya membuat pembayaran balik sejak skim itu diperkenalkan 25 tahun lalu. Ahli Lembaga AIM, Aizul Fidy Kamarudin, berkata AIM mengeluarkan pinjaman keseluruhan bernilai RM11.2 bilion kepada 347,084 golongan miskin memulakan kegiatan ekonomi berasaskan kemahiran sejak skim mikro kredit itu diperkenalkan pada 1989. "Dari segi pembayaran balik, kita masih berada pada tahap baik iaitu sekitar 99 peratus. "AIM bukan saja hanya sekadar institusi mikro kredit, bahkan ia mengorak langkah dengan menambah program latihan dan pembangunan keusahawanan yang komprehensif. “Semua ini hasil sokongan pihak kerajaan yang memberikan dana kepada AIM,” katanya. Beliau berkata demikian pada majlis pemeteraian Memorandum Persefahaman (MoU) antara AIM dan Agensi Kaunseling dan Pengurusan Kredit (AKPK) di Kuala Lumpur, semalam. Menerusi MoU itu, seramai 85 pelajar Taylor's University akan dilatih AKPK dengan ilmu pengurusan wang dan pengawalan hutang, yang mana pelajar itu kemudian akan menabur khidmat membimbing 25 sahabat AIM terpilih secara percuma. AIM diwakili Pengarah Urusan, Norsharizal Masharin manakala AKPK oleh Ketua Pegawai Eksekutif, Azaddin Ngah Tasir. Hadir sama ialah Pengerusi AKPK, Datuk Mohd Hanif Sher Mohamed dan Dekan Fakulti Perniagaan Taylor’s University, Vinitha Gupthan. Aizul berkata, bagi tempoh sembilan bulan pertama tahun ini, AIM sudah mengeluarkan pembiayaan bernilai RM1.4 bilion dengan sasaran pemberian pembiayaan RM1.9 bilion hujung tahun ini. Badan amanah persendirian itu katanya, menyasar mengeluarkan pembiayaan lebih RM2 bilion tahun depan. Beliau berkata, lebih membanggakan lagi ialah program 1AZAM yang berjaya mengeluarkan peserta daripada pendapatan RM460 sebulan kepada RM1,500 hingga RM3,500 sebulan. “Daripada 28,795 peserta keseluruhan 1AZAM, serama 21,160 peserta berada dalam lingkungan pendapatan RM1,500 hingga RM3,500 ke atas sebulan. Ini menunjukkan pinjaman yang diberikan berjaya mengakhiri zaman kemiskinan di kalangan peserta 1AZAM dengan menggalakkan rakyat berpendapatan rendah berdikari,” katanya. Beliau berkata, modal kumulatif diberikan kepada peserta itu setakat ini berjumlah RM333.576 juta. Bagi tempoh sembilan bulan 2014, AIM mengeluarkan RM27.856 juta kepada 4,616 peserta 1AZAM. Projek 1AZAM diperkenalkan bagi menyediakan peluang pekerjaan kepada golongan miskin tegar dan miskin, menambah pendapatan sehingga melebihi had garis kemiskinan. Empat peluang menambah pendapatan dikenal pasti, iaitu penempatan pekerjaan; perniagaan kecil-kecilan; penyediaan perkhidmatan; dan pertanian. Program 1AZAM dilaksanakan ke seluruh negara secara berperingkat dengan program perintis di Iskandar Malaysia pada Januari 2010. AIM ialah sebuah badan amanah persendirian ditubuhkan pada 17 September 1987 melalui Suratcara Perjanjian AIM dan didaftarkan di bawah Akta Amanah (Perbadanan) 1952 (pindaan 1981) (Akta 258). 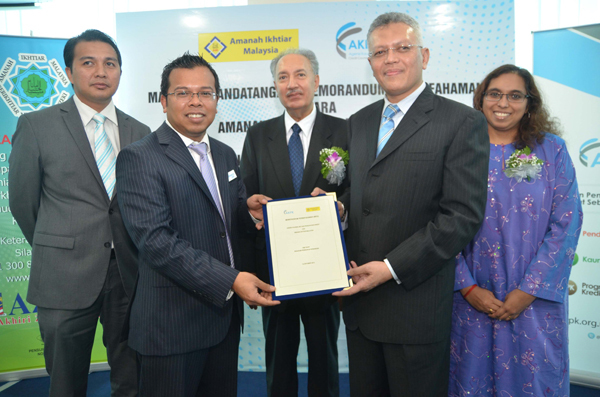 Agensi Kaunseling dan Pengurusan Kredit (AKPK), a wholly owned subsidiary of Bank Negara Malaysia, has signed a memorandum of understanding with Amanah Ikhtiar Malaysia (AIM) in their joint efforts to enhance financial literacy levels of ‘Sahabat’ of AIM. The signing ceremony which took place recently, was witnessed by AKPK’s Chairman, Y. Bhg Dato' Mohd Hanif Sher Mohamed, En. Aizul Fidy Kamarudin from the Board of Directors of AIM and Ms Vinitha Gupthan, Dean of the Business Faculty, Taylor’s University. This MOU aims to increase the income generating capability of the ‘Sahabat’ of AIM by building their financial skills and confidence as micro entrepreneurs. Additionally, this MOU serves to monitor the cash flow of the participants before and after enrolling into the programme. In addition to this, AKPK and AIM as well as students from Taylor’s University are embarking on a CSR effort to ensure the participants of this programme are able to maintain and generate more income to sustain their livelihood. AKPK looks forward to increase the awareness of the importance of prudent financial management with the aimof creating a financially savvy Malaysian society. 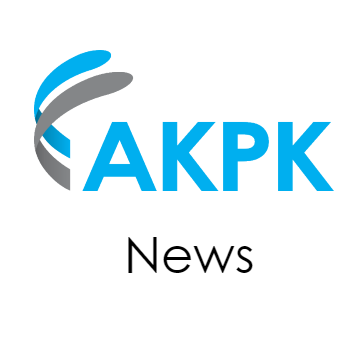 Credit Counselling and Debt Management Agency (AKPK) plans to focus on financial education to create awareness to the public on basic money management skills and the responsible use of credit. Its newly appointed CEO Azaddin Ngah Tasir said the financial education plays the most essential part to curb the financial debt problem and act as an early prevention to it. “We believe prevention is better than cure. In other words, we better educate them before they fall into the debt traps,” he said during the sideline of the AKPK’s Memorandum of Understanding (MoU) signing with Amanah Ikhtiar Malaysia (AIM) yesterday. Under his leadership, he wants to change the perception of the people that AKPK is not just the place for highly indebted individuals but for everyone that need professional advice in managing their finances. Azaddin said he plans to introduce various programmes that will suit all lifecycle going forward next year, which will focus on universities students, fresh graduates, individuals who want to raise a family and also retirees. He said these four categories of people have different needs for instance young people would keen to know more about car loans and credit card procedures while those who are raising a family would like to know more about insurance and how to protect their children. “We would like to provide them with such professional advices and we provide it free of charge,” he said. To date, 292,775 individuals have attended AKPK’s counseling services and from that number, 115,706 customers have applied to enroll into its debt management programme (DMP). Azaddin said out of the 115,706 cases they received through DMP since the programme been introduced, 6,271 cases with total outstanding of RM255.1 million has been successfully solved while 69,666 cases is still under the programme with a total portfolio value of RM5.7 billion. He said financial planning was the main cause of debt problems with 22.8%, follow by high medical expense and failure or slowdown in business registered at 16.2% and 16.1% respectively. Other reasons includes lost control on usage of credit, job retrenched and high cost of living. Commenting on whether high cost of living will increase the debt cases, Azaddin said the issue of high cost living is not new and it is the responsibility of the individual to manage their financial. “As consumers, we need to lay out a plan when we buy something or getting out a loan to make sure we are capable of affording it. “We in AKPK are willing to help in providing professional advise to everyone to assist them on their financial management,” he said. Earlier, AKPK has signed a MoU with AIM to enhance financial education among the members of AIM called SAHABAT. This move is to help SAHABAT to gain the skill in managing their finance and sustaining their businesses. Isu pengurusan hutang dalam kalangan anak-anak muda bakal menjadi aktivis utama penganjuran Hari Terbuka Lions Clubs International pada Ahad ini. Acara yang bakal diadakan di pusat beli belah Viva Home itu diadakan dengan kerjasama Agensi Kaunseling dan Pengurusan Kredit (AKPK). AKPK, anak syarikat milik penuh Bank Negara Malaysia, ditubuhkan untuk menyediakan saluran bagi peminjam mendapatkan nasihat dan bantuan dalam menguruskan kewangan dan hutang mereka. Peminjam boleh mendapatkan bantuan AKPK dalam penjadualan atau penstrukturan semula pinjaman perumahan, pinjaman sewa belo dan pinjaman peribadi dan baki kad kredit tertunggak yang perlu dibayar kepada penyedia kewangan di bawah bidang kuasa Bank Negara Malaysia. Sejak ditubuhkan sehingga 31 Ogos 2014, seramai 286,368 menghadiri perkhidmatan kaunseling di AKPK dan 113,845 pelanggan memohon untuk mendaftar ke dalam Program Pengurusan Hutang. Usaha bersama AKPK dengan Lions Clubs menyediakan saluran untuk mendekati dan mewujudkan kesedaran kepada isi rumah Malaysia mengenai perkhidmatan yang disediakan AKPK untuk membantu membendung isu berkaitan kewangan yang dihadapi orang ramai hari ini. 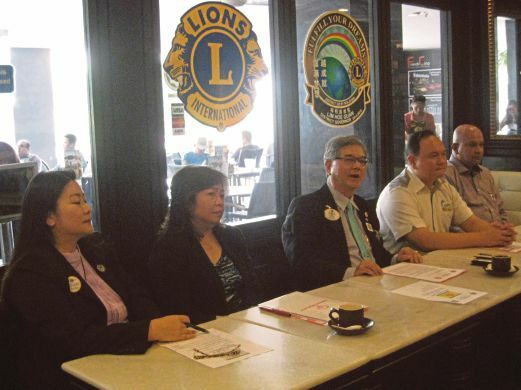 Menurut Gabenor Daerah Lions Clubs International Lim Hoe Guan, mereka yang menghadapi masalah kewangan perlu mengalihkan pemikiran mereka untuk mencari jalan penyelesaian, bukannya melarikan diri daripada masalah. Pada masa sama, Ketua Pembangunan Khas Sukan Olimpik Kuala Lumpur, Nur Azida Daud pula berkata, peningkatan kesedaran awam mengenai keperluan orang kurang upaya intelek atau ID seharusnya diberi perhatian oleh masyarakat. “ID adalah satu istilah yang digunakan untuk menggambarkan seseorang yang mempunyai had tertentu dalam fungsi kognitif dan kemahiran lain, termasuk komunikasi dan penjagaan diri. Ini menyebabkan kanak-kanak lambat atau perlahan dalam pelajaran. Malah kecacatan intelek adalah kecacatan pembangunan yang paling biasa,” tambah Nur Azida. Sukan Olimpik Khas akan menghasilkan perubahan hidup melalui kuasa sukan dengan menggalakkan orang kurang upaya intelek ini bergaul dengan orang ramai. Untuk itu Lions Clubs dan Olimpik Khas Asia Pasifik memulakan beberapa program untuk memberi kesedaran kepada ID agar dapat bergaul dengan masyarakat. Lions Clubs melalui rangkaian di seluruh negara, akan membantu AKPK, Polis di Raja Malaysia (PDRM) dan Olimpik Khas menyebarkan maklumat mengenai peranan mereka sekali gus meningkatkan kesedaran mengenai sumbangan kepada belia dan orang ramai untuk memupuk masyarakat progresif. Hari terbuka berkenaan menyediakan pelbagai gerai pameran mengenai projek dan perkhidmatan utama disediakan Lions Clubs dan rakan mereka seperti Pertubuhan Global Keselamatan Jalan Raya, St Johns Ambulans, Olimpik Khas Asia Pasifik, PDRM dan Jabatan Bomba. KUALA LUMPUR: The local branches of an international community service organisation are counting on generating more public awareness of their role in society and membership growth through an Open Day at Viva Home Shopping Mall in Cheras here on Sunday. Through this inaugural event, which is to be held at the mall’s Exhibition Hall 1 on Level 2 from 10am to 6pm, the Lions Clubs International (District 308 B1, Malaysia) aspire to achieve these two goals, with the first to promote the Lions’ social outreach programmes which have empowered volunteers to serve their communities and meet humanitarian needs at home and abroad. The second is to engage members of the public to participate in the Lions’ activities. At a press conference, District 308 B1 Governor Lim Hoe Guan urged the public to embrace the Lions’ spirit of “We Serve” and help the organisation bring these initiatives to their respective communities. A key activity to be launched at the Lions Open Day, with the theme of “Strengthening the Pride Through Service”, is the promotion of debt management issues among youngsters in collaboration with the Credit Counseling and Debt Management Agency (AKPK). AKPK, a wholly-owned subsidiary of Bank Negara Malaysia, was set up to provide an avenue for individual borrowers to seek advice and assistance in managing their finances and debts. Individual borrowers can seek AKPK’s assistance in rescheduling or restructuring their housing loans, hire purchase loans and personal loans, and outstanding credit card balances. The Lions Open Day also focuses on the needs of the intellectually disabled (ID) community in the country, whose members discover new strengths, abilities and skills through the Special Olympics. Lim said the Special Olympics changes lives through the power of sport by encouraging and empowering people. The Lions Open Day will feature booths to showcase, promote and educate the public on the key projects and services rendered by the Lions and their partners, such as the Global Road Safety Partnership Foundation, St John Ambulance, SOAP (Special Olympics Asia Pacific), police and Fire and Rescue Department. Special informative talks would be conducted throughout the day which will feature presentations from Lions and their partners on glaucoma, cataract & vision impairment, financial management & counselling, crime prevention & road safety as well as the Lions Education Assistance for the needy. Public health activities such as blood donations; organ pledges; eye and glaucoma screenings and St John Ambulance First Aid & CPR demonstration will also be held. A Food Fair will also be set up, with lucky draws, contests, games and telematches for visitors. KUALA LUMPUR: THE recent inaugural Lions Open Day at Viva Home Shopping Mall in Cheras, here, was a roaring success. Thousands thronged the mall’s exhibition hall to learn more about the community service organisation, its activities and projects. Through the event, which carried the theme “Strengthening the Pride Through Service”, Lions Clubs International (District 308 B1, Malaysia) has achieved its primary objective of promoting its social outreach programmes which, over the years, have empowered volunteers to serve their communities and meet humanitarian needs at home and abroad. The Lions movement also raised public awareness of their role in society and recruited more members. District 308 B1 governor Lim Hoe Guan was pleased to see the public’s eagerness to embrace the Lions’ spirit of “We Serve” and help the organisation to bring its initiatives to their communities. Credit Counseling and Debt Management Agency (AKPK) chief executive officer Azaddin Ngah Tasir was the guest-of-honour. Besides setting up a booth, AKPK officers also distributed flyers and pamphlets about the agency. AKPK, a wholly-owned subsidiary of Bank Negara Malaysia, was set up to provide an avenue for individual borrowers to seek advice and assistance in managing their finances and debts. Individual borrowers can seek AKPK’s assistance in rescheduling or restructuring their housing loans, hire purchase loans and personal loans, and outstanding credit card balances due to financial providers under the purview of Bank Negara Malaysia. Booths were also set up by St John Ambulance of Malaysia, Hospis Malaysia, Police, Fire and Rescue Department, and Malaysia Global Road Safety Partnership Foundation to showcase their services. Some 40 Kelab Keselamatan Kanak-Kanak Bomba members took part in an interactive game which highlighted fire safety and prevention. Lions members were stationed at various booths to highlight their movement’s programmes, including Kuala Lumpur Lions Renal Centre, Education Foundation, Youth Camp Exchange and Lions Clubs In ternational Foundation. Public health activities such as blood donation, organ pledges, eye and glaucoma screenings as well as cardiopulmonary resuscitation demonstrations were also held. There was a food fair, lucky draws, contests, games and a Peace Poster contest for children. 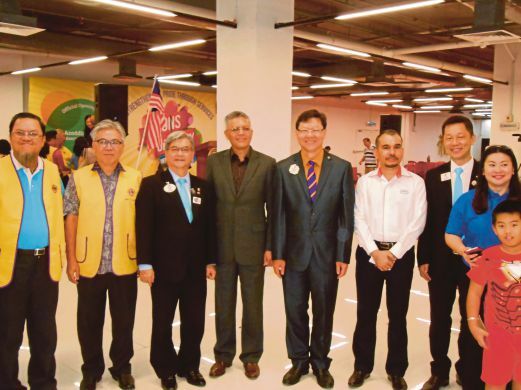 Lim Hoe Guan (third from left), Azaddin Ngah Tasir (fourth from left) and other Lions Club dignitaries posing for a group shot at the launch of the Lions Open Day at Viva Home Shopping Mall.